The teaching materials for the learning experience on “Acquiring Spiritual Knowledge” are divided into four parts. Part 4 should be taught about halfway through the school year as a review for students. In this part of the learning experience, students will review the “Acquiring Spiritual Knowledge” section in the Doctrinal Mastery Core Document. They will also practice reframing questions and concerns to examine them with an eternal perspective. 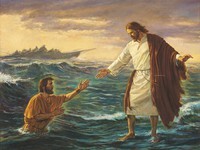 Point out that when Peter diverted his attention away from the Savior and onto the wind and waves, he began to fear and then to sink into the water. Invite students to ponder any influences in their lives that seek to divert their attention away from Jesus Christ. Explain that as we seek to obtain spiritual knowledge throughout our lives, there will be influences that will attempt to divert our attention away from Jesus Christ. How might our ability to acquire spiritual knowledge be diminished if we take our attention away from the Savior? Invite students to look at the last sentence in paragraph 6 in principle 1, “Act in Faith,” in the “Acquiring Spiritual Knowledge” section in the Doctrinal Mastery Core Document, which contains the following key statement of doctrine: The Lord Himself has invited us to “look unto [Him] in every thought; doubt not, fear not.” If they have not already done so, invite students to consider marking this statement in their copies of the Doctrinal Mastery Core Document. How does this statement encourage us to seek spiritual knowledge from God? How can we look to the Lord when we have questions and concerns? In what ways does looking to God and not doubting increase our ability to acquire spiritual knowledge? Write the following question on the board: What will help me as I seek to acquire spiritual knowledge? Divide students into pairs. Assign one partner to read paragraphs 3 and 6 in the “Acquiring Spiritual Knowledge” section in the Doctrinal Mastery Core Document. Assign the other partner to read paragraphs 8 and 11 in the “Acquiring Spiritual Knowledge” section in the Doctrinal Mastery Core Document. Invite the partners to read their paragraphs aloud to each other, looking for answers to the question on the board. Invite students to consider marking the truths they find that answer the question. After sufficient time, invite students to share what they found with the class. You may want to list students’ responses on the board. How does your attitude and intent affect your ability to learn by the Spirit? In what ways does relying on what you already know increase your ability to receive more spiritual understanding? How can examining questions and concerns you have about the plan of salvation help you acquire spiritual knowledge? Why is it important to know that God reveals truth through safe and reliable sources? How have you applied the truths found in the “Acquiring Spiritual Knowledge” section in the Doctrinal Mastery Core Document and received spiritual knowledge from the Lord? Encourage students to continue to look unto the Lord and not doubt (see D&C 6:36) as they actively practice the principles of acquiring spiritual knowledge. Invite students to turn to the “Acquiring Spiritual Knowledge” section in the Doctrinal Mastery Core Document and the three principles discussed there for guiding us as we seek to learn and understand eternal truth: act in faith, examine concepts and questions with an eternal perspective, and seek further understanding through divinely appointed sources. Explain that the following exercise will focus on examining concepts and questions with an eternal perspective. Give each student one piece of paper that would fit inside each of the two frames in the accompanying handout. Invite students to think about gospel-related questions they may have asked or be seeking answers to or questions their friends or family members may have asked. These questions could include social issues, questions about overcoming challenges, or other concerns. Once students have had time to formulate a question, invite them to write their question on the piece of paper. Remind them that part of examining concepts and questions with an eternal perspective includes reframing the question, or seeing the question differently. Consider showing the video “Examining Questions with an Eternal Perspective” (2:56), which is available on LDS.org. If you show the video, ask the class to watch for how a young woman examined her friend’s question about God with an eternal perspective. If you choose not to show the video, it may be helpful before students begin the activity to provide an example of how to reframe a question. Following the video, provide each student with a copy of the “Reframing Questions” handout. Ask students to place the piece of paper with their question inside the “Limited Perspective” frame at the bottom of the handout. Give students a few minutes to imagine that someone without an eternal perspective is asking this question. What beliefs or assumptions do you think a person with a limited perspective might have? Encourage students to write these beliefs or assumptions on or near the “Limited Perspective” frame. How would this person’s beliefs or assumptions influence his or her conclusion? Invite a student to read aloud paragraph 8 in the “Acquiring Spiritual Knowledge” section in the Doctrinal Mastery Core Document. Invite students to follow along, looking for questions we can ask that can help us reframe a question or concern with an eternal perspective. Invite students to consider marking the two questions at the end of that paragraph: What do I already know about Heavenly Father, His plan, and how He deals with His children? What gospel teachings relate to or clarify this concept or issue? 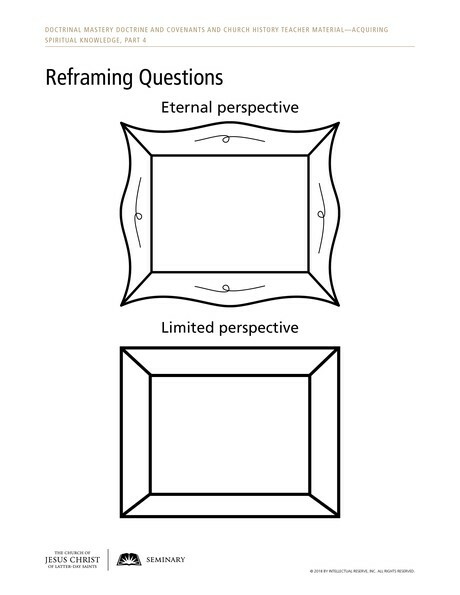 Invite students to move their piece of paper up into the “Eternal Perspective” frame. Point out that the question itself does not change, but as we look at it with an eternal perspective our understanding will change. Invite students to consider answers to their question by examining it with the two questions in paragraph 8. Encourage them to write their answers on or near the “Eternal Perspective” frame. How would these beliefs or assumptions influence our conclusion? As you observe students working, you may consider privately inviting one or two students to be prepared to share a few thoughts about their experience as they examined their question from an eternal perspective. After sufficient time, ask these students to share their experience. You may also want to ask the class if there are any questions or issues they chose to examine that they would like to discuss as a class. In conclusion, invite students to continue to apply the principles of acquiring spiritual knowledge as they seek answers to questions they may have. Testify of the Lord’s promise to answer us as we diligently seek truth from Him. Note: The following activity could be used as part of segment 2. Explain that sometimes we will know the truths that will help us reframe a question, but at other times we may need to seek for these truths. Invite a student to read aloud the following statement by Elder L. Whitney Clayton of the Presidency of the Seventy. Ask the class to listen for what Elder Clayton counseled us to do as we seek for spiritual knowledge. “[God] doesn’t show us the whole picture from the outset. That is where faith, hope, and trusting in the Lord come in. “God asks us to bear with Him—to trust Him and to follow Him. … He cautions us that we shouldn’t expect easy answers or quick fixes from heaven. Things work out when we stand firm during the ‘trial of [our] faith,’ however hard that test may be to endure or slow the answer may be in coming” (L. Whitney Clayton, “Whatsoever He Saith unto You, Do It,” Ensign or Liahona, May 2017, 99). What did Elder Clayton counsel us to do as we work to acquire spiritual knowledge?